Start off your visit on the 8th (Thu): explore and take pictures at Ponce de Leon Inlet Lighthouse & Museum, then take a leisurely stroll along Boardwalk Amusement Area and Pier, and then enjoy the sand and surf at Beach at Daytona Beach. Keep things going the next day: kick back and relax at Ormond Beach, then admire all the interesting features of Daytona International Speedway, and then stop by Angell & Phelps Chocolate Factory. To see ratings, reviews, where to stay, and tourist information, you can read our Daytona Beach trip planner. Orlando to Daytona Beach is an approximately 1.5-hour car ride. You can also do a combination of train and shuttle; or do a combination of bus and shuttle. 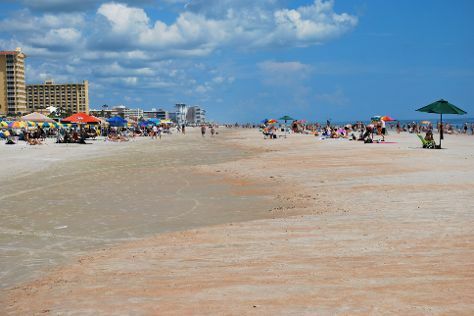 In June, daily temperatures in Daytona Beach can reach 89°F, while at night they dip to 72°F. Finish up your sightseeing early on the 10th (Sat) so you can go by car to Clearwater. Get ready for a full day of sightseeing on the next day: enjoy the sand and surf at Clearwater Beach. For maps, ratings, and other tourist information, read Clearwater itinerary planner. Traveling by car from Daytona Beach to Clearwater takes 3 hours. Alternatively, you can take a bus; or do a combination of shuttle, train, and bus. In June, daytime highs in Clearwater are 89°F, while nighttime lows are 75°F. Wrap up your sightseeing by early afternoon on the 11th (Sun) to allow time for the car ride to Orlando. Attractions like Walt Disney World Resort and Universal Orlando Resort make great kid-friendly stops. When in Orlando, make a side trip to see Extreme Jet Ski of Orlando in Kissimmee, approximately 36 minutes away. Pack the 14th (Wed) with family-friendly diversions at Universal's Islands of Adventure. Pack the 18th (Sun) with family-friendly diversions at Disney's Animal Kingdom. Next up on the itinerary: admire nature's wide array of creatures at SeaWorld Orlando, enjoy some diversion at Lake Eola Park Orlando Swan Boats, make an unforgettable trip to Epcot, and make a splash at Discovery Cove. To see traveler tips, ratings, maps, and more tourist information, you can read our Orlando custom trip planner. Traveling by car from Clearwater to Orlando takes 2.5 hours. Alternatively, you can do a combination of bus and train; or take a bus. In June, daily temperatures in Orlando can reach 90°F, while at night they dip to 73°F. Finish your sightseeing early on the 19th (Mon) to allow enough time to travel back home.